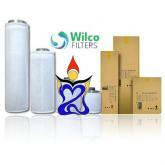 The "low-density" carbon used for the Wilco Light Weight Filters is more efficient and lighter than the high density carbon used by most manufacturers of carbon filters. With the "high-density" Carbon the coal dust is compressed into rods of which only the tip filters the air. A filter with the "high- density" carbon is considerably heavier than a filter with "low density " carbon. The "low- density" carbon is mined in a natural way after which it is sieved for fragments of the desired size. These pieces are not only lighter but also allow more air to pass than the "high density" carbon. Also, the diameter of the holes in the outer wall is greater than in most existing carbon filters, with the result that the extractor can run easier.